At the start of January we are usually full of beans and raring to race head long into the coming year. Then, as the month slowly trundles on the weather gets colder and the nights seem longer and darker. The bills arrive showing any debt built up during the Christmas spending spree. We have usually abandoned our New Years resolution and lost our motivation to continue but still have a feeling that we need to take action. All of this leads to what the experts call Blue Monday, the most depressing day of the year and in 2013 it falls on Monday 21st January. So, for this reason Blue Lace Agate has been chosen as our favourite crystal of the month as it brings in a cooling peace of mind and helps us to freely express our thoughts and feelings. January is a hard month to get through for many as the lack of sunshine and warmth reduces our energy levels and this is where this crystal comes into its own. It is a deeply nurturing and supportive stone that works by evenly balancing out the physical, emotional and intellectual energies. 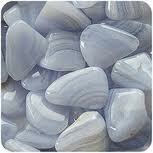 Blue Lace Agate is an amazing stone that works especially well on the throat, neck, shoulder and chest area. Opening up the throat chakra to allow free self-expression and new modes of communication which can be highly beneficial when one is starting to feel down and out of sorts with themselves. This is a variegated form of Chalcedony that displays differing pretty shades of blue and white often found in a lace pattern effect when the stone is polished and tumbled. 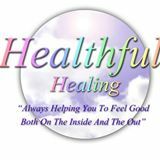 When used in a healing environment it is especially beneficial to arthritic and rheumatoid conditions, which can be worsened during the cold damp winter months. It is known for strengthening the skeletal system as a whole and cleanses the lymphatic system. Wearing a piece of Blue Lace Agate will enhance your mental function, increase your concentration levels and analytical abilities. This is exactly what is required to overcome the depressive feelings that can be sensed on Blue Monday.